Seismic Surveys provides damage claim or complaint resolution assistance to Contractors, Developers, Engineers and Insurance companies. In the event of neighbor complaints or concerns from blasting operations, the Contractor, Mine Operator, or its authorized agent will document all complaints or claims on a Blasting Complaint Form. The typical process for addressing a neighbor complaint or concern is to promptly arrange a meeting with the neighbor. 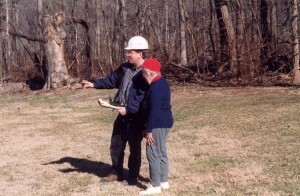 A supervisor with the Contractor or Mine will meet with the neighbor, often times along with their vibration consultant, to discuss and document the neighbor’s concerns. Blast and seismograph records are reviewed; and, if there is not a seismic measurement at the complainant’s structure for the blast in question, then subsequent blast(s) are monitored with a seismograph at the complainant’s structure and a seismograph at the location monitored on the day of the complaint. A report of findings will be prepared and reviewed with the complainant in a timely fashion, usually within two to four weeks. The complaint will usually be resolved between the neighbor and the contractor/mine operator subsequent to this investigation.